Bridgitte is a young adult with a passion for horseback riding; she suffered a traumatic brain injury from a car accident when she was 8 years old. "A year ago I didn't have any feeling in my hand at all. I wasn't able to use it much. My most remarkable day was when Terri (Bridgitte's therapist) first put [the H200] on my arm and I saw my hand open without me having to think about it too hard." "My home therapy program is I use the H200 two hours in the morning, take it off, and I'll wear it again two hours at night after dinner. I also wear it to school in the morning. My arm feels more relaxed after using it." "It's easy to use the H200. It just slips on you - slides on - your arm. Put it on, close the top, plug it in, and turn it on. Then my hand will start opening and closing automatically." "Now since I've been using the H200, I've been getting more sensation back in my fingers, and now I'm using it [my hand] more without even thinking about using it - like in school holding papers down, folding towels at home, making my bed, hanging clothes up, helping with the dishes. I can now groom the horse with just my left hand without losing my grip, hanging onto the reins better." "I like the electrical stimulation of the H200. I like the sensation of being able to accomplish ordinary tasks again. I like that it treats more than just my hand. It's therapy that helps my body, mind, and soul." 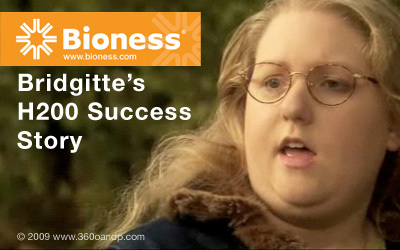 "The changes I've seen in [Bridgitte] after using the H200 are when she's not wearing the device. She'll wear the device when she's on her way to therapy, or even a couple of hours before therapy, but when she gets into therapy she is working without the device on her hand. And so the carryover from using the H200 can be long lasting. And it's very effective for then being able to function in her life without the device on." "The most exciting day I've had with my patient was a day that Bridgitte came in and we did some grooming, and we probably hadn't done grooming for a couple of weeks, and she'd been using the H200 for about three months, and the fact that she was able to hold onto the curry comb and the brushes that we use to groom the horse - she could hold onto them with her affected hand - and brush the horse. It was just amazing. The joy in her face that she was able to accomplish it was just thrilling. It was something she hadn't been able to do in the five years that I've worked with her." *Individual results vary. Consult with a qualified physician to determine if these products are right for you.